Why, Hello Mr. U-Haul. Old Friend. And here we go again. Boxes, tape, cleaning, packing, lifting - all the joys of moving. This will make the 4th city we've lived in - in the past 2 years. Tampa. Greensboro. Raleigh. Atlanta. I'm actually not complaining. We're quite excited about the move and will finally get to buy a house! (New Year's Resolution - check). TB has a great new job and I have a new position with the same company. And this may actually mean that we'll be able to eat a dinner together on a weeknight! Wow, that hasn't happened since........well........ a while. 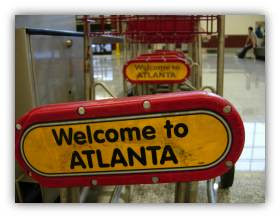 Since ATL is close to where I'm from, I'm so excited to show TB all the fun things to do in the city. The Coke Museum, the Zoo, Stone Mountain, the Braves, Centennial Park, Piedmont Park.... We might seem like tourists for the first few months, but what better way to get to know your new city? I must say that I am a little concerned about how TB will handle the traffic. He tends to have a slight case of the road rages. OK, so maybe a major case of them. Hmmmm, but you know I may be able to make this road rage work to my advantage.. I'm thinking this may actually help my case of purchasing a home in the city and not in the burbs. "You don't like cake? Oh. You don't like cake." As February is drawing to a close, I suppose I should catch everyone up on an important event that happened at the beginning of the month (bad blogger - I know). TB had a rather important birthday, and true to my traditions - I had to call a lot of attention to his birthday and do my very best to embarrass him. Perhaps sometimes I should check my excitement. During the celebration, I asked TB why he wasn't eating the cake. I mean, afterall, I did get it with mocha filling, his favorite flavor. He then burst my bubble and politely reminded me that he doesn't like cake. I knew that. But totally forgot. Bad. Wife. Darn that excitement. Regardless of the cake incident, it was a fabulous time and great to catch up with all of our friends!